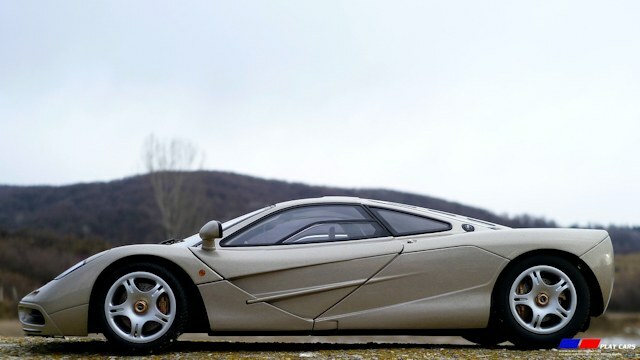 The McLaren F1 needs no introduction. 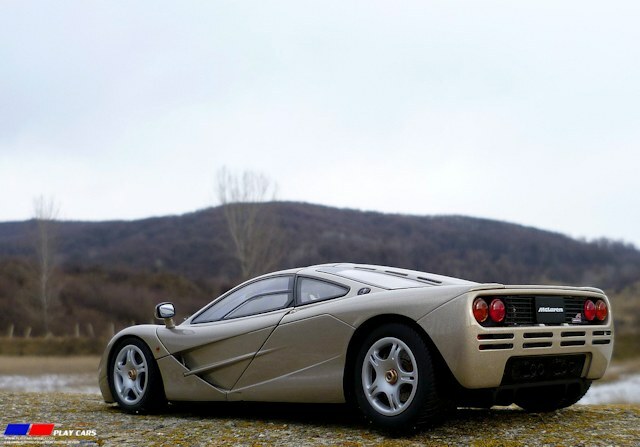 It is a legend and every petrol head knows and loves it. 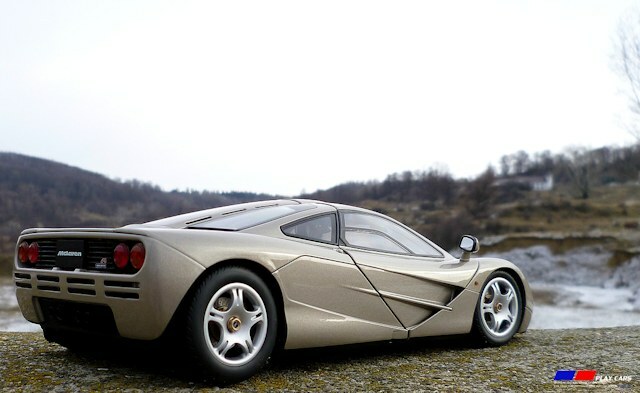 But here I will have more things to say about the McLaren F1, because I will take a look at the 1:18 AUTOart model. First of all I must say, this isn’t the first scale replica of this iconic car. It was already replicated by various manufacturers in many versions and scales. 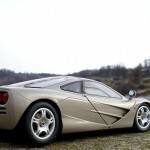 AUTOart released their model in a period when, even if poorly made, it was hard enough to get one of the already existing models. 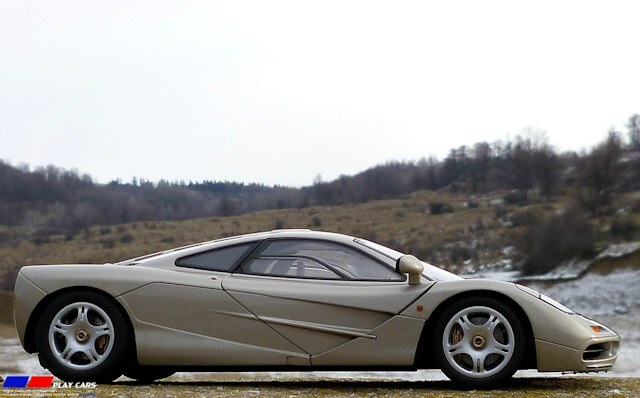 Maisto’s F1 was poorly made and rare, and the UT version was sub par, hard to find and expensive, which is where AUTOart came in to play and released the McLaren F1 as a model in the Signature line. A limited edition of course, for each color. The model comes together with a certificate, a magnifying glass and a micro fiber cloth for cleaning it. Inside the box, you’ll find a little manual which informs you how to operate the little functional parts. The entire box is wrapped in a protective plastic sheath. 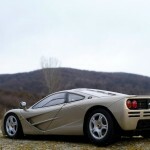 Opening the traditional package branded with the “McLaren” logo, you’ll see for the first time the best model that AUTOart put in 1:18 scale, ever. It’s been 4 years now, since they’ve released it, and I still can say this is the best road car model in the Signature level. The stance and dimensions are spot on, without a doubt. The model is painted perfectly, in a uniform and thin layer, the paint appears glossy and metallic. No shade differences between the painted plastic and metallic parts. It’s quite heavy because it’s made of several individual parts and a lot of metal. Before taking a closer look to every detail, it must be said that the model radiates so much realism from every angle, underlining the quality and craftsmanship put into the engineering and manufacturing processes. Let’s begin from the front, where the lights are nicely made and the turn lights are attached with visible stubs of the same color with the plastic cover. 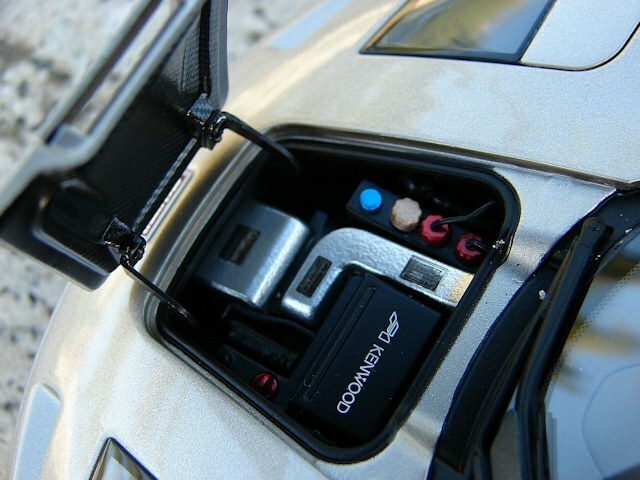 The lights’ interior doesn’t look bad , but the silver plastic used for the reflective parts looks cheap. The logo is tampo applied and crafted to look like a raised piece. 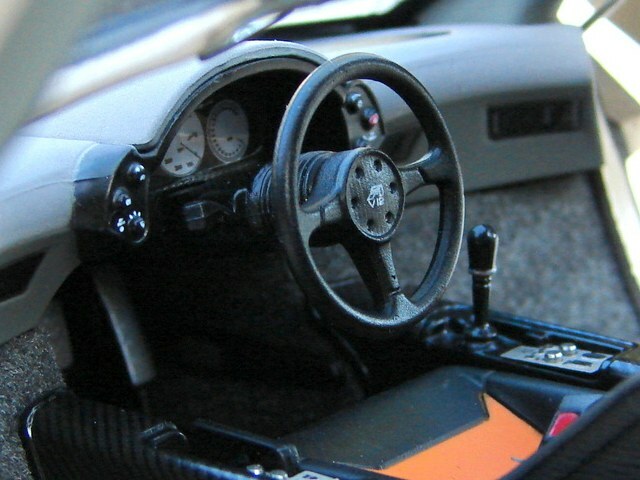 Looking from the side, the shut lines are minimal and all the design features from the real car are very well replicated. The turn lights and mirrors are made of plastic. 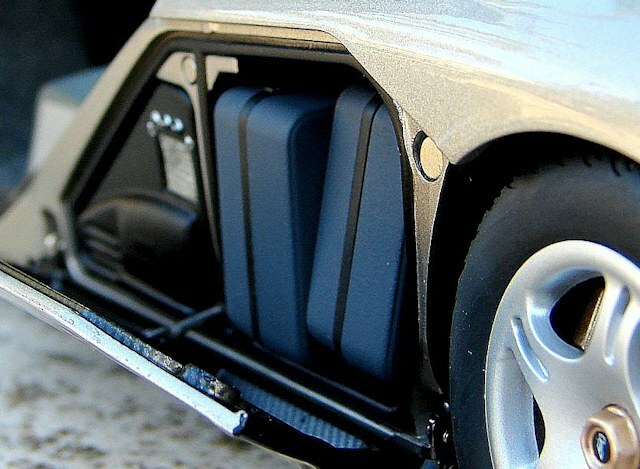 Autoart included a beautiful detail here: the panels to the luggage compartments are functional, opening on real hinges and struts. 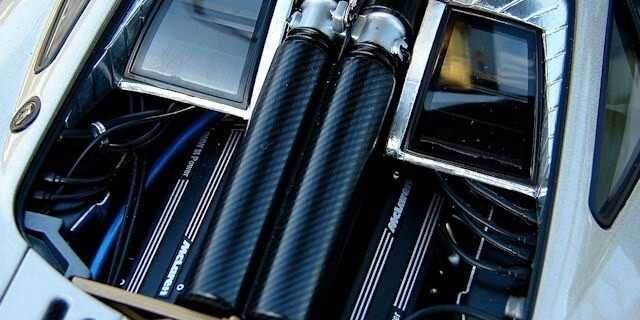 On the inside, the carbon fiber pattern looks perfect. Some parts were individually painted and even the labels are replicated on metallic photo etched parts. To fix the panels in closed position, a pair of magnets are mounted and are doing their job well. 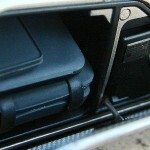 Inside, we have suitcases made of soft plastic of different sizes. The whole ensemble looks fantastic. The doors bolts are made with separate metallic parts, very detailed for their size. Carefully done is the fuel lid, too, finished to look like a separate part. On the rear side, the air vents are covered with real mesh and the taillights are made of translucent plastic for a great effect. The car logo is only a decal here. They didn’t forget about the rear and fog lights, which are all present under the mask and visible. The rims look perfect, having the central nut as an individually made, painted piece. The brakes are also highly detailed. The disks are covered with a metallic part and dimpled to fake crossed drill. 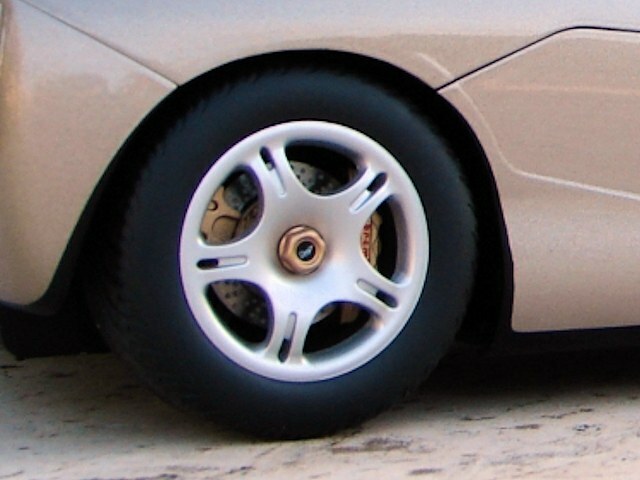 The rotors appear to be separately mounted and painted pieces, in the same color as the calipers. The “Brembo” inscription is on every caliper and on the rear side there are additional hand brake calipers. Made of soft rubber, the tires keep the generous dimensions and the right profile, but aren’t branded. The manufacturer was very careful with all the details here, too and the result is fantastic. The doors open on real hinges, while the struts keep them open. 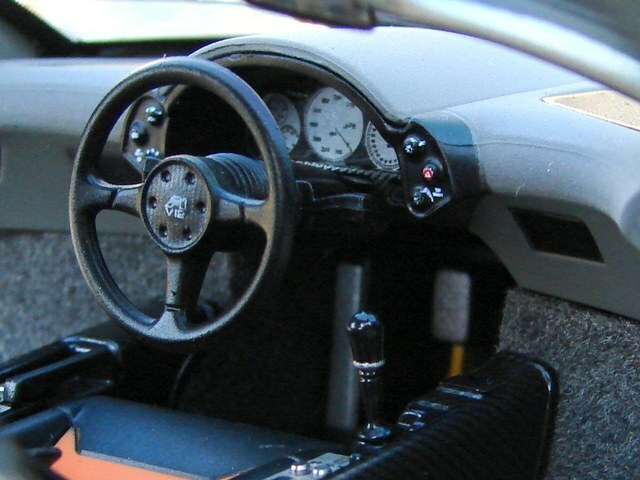 There is the same spartan interior as in the real car, but extremely well detailed. All the structures surrounding the driver seat are carbon printed and look like real thing. The buttons are raised metallic pieces and are individually marked. For the main indicators they’ve used a legible sticker and the few buttons around are each marked and painted. Of course, the interior is carpeted and the seat belts are textile made. The front lid opens on really fine hinges and has the interior covered with a carbon printed plastic. It looks like its real counterpart. 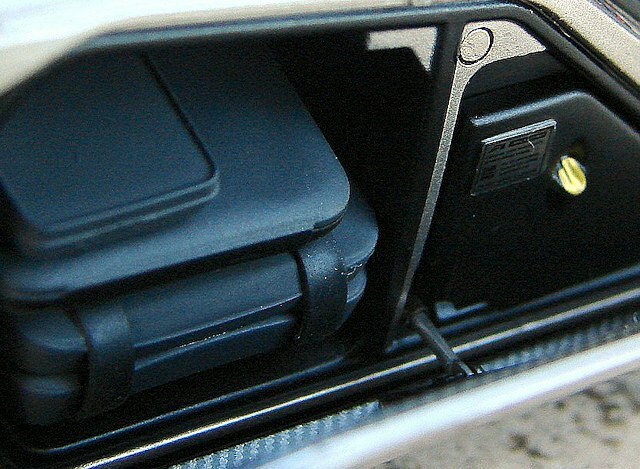 The compartment under the lid contains separately made parts, having the labels applied on, some lids individually painted and wired and the black box of the car, which is branded. But the show really starts on the rear side. The engine bonnet with transparent windows and real meshes for air vents opens on real hinges and has a strut like the real car. The details are accurately and carefully replicated. 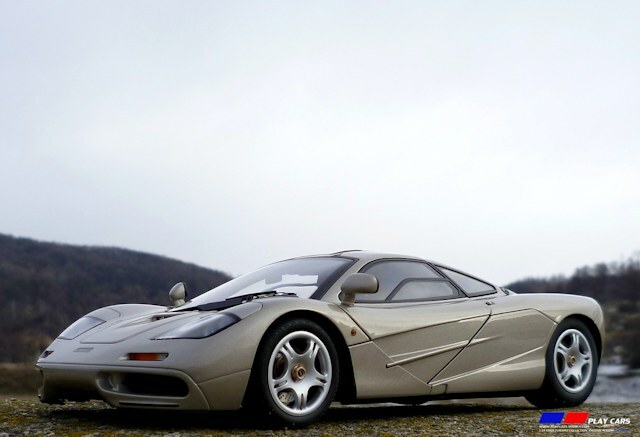 The engine has parts covered in the same perfect carbon decal, and is marked with the name of the car and the engine manufacturer and provides a lot of wires and hoses. Even the rivets are finished to look like raised parts. Under the engine, a part of the exhaust system can be seen. 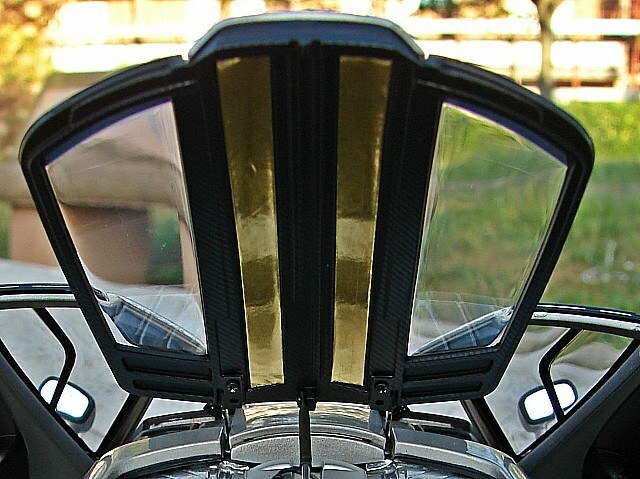 The lid of the engine bay, including the frames for the 2 little windows which separate it from the cockpit is covered with a perfect replica of the real gold foil. Even the texture is the same as on the real car. We have a second functional lid here, which opens on discrete hinges and has a replicated minuscule functional strut to keep it open. 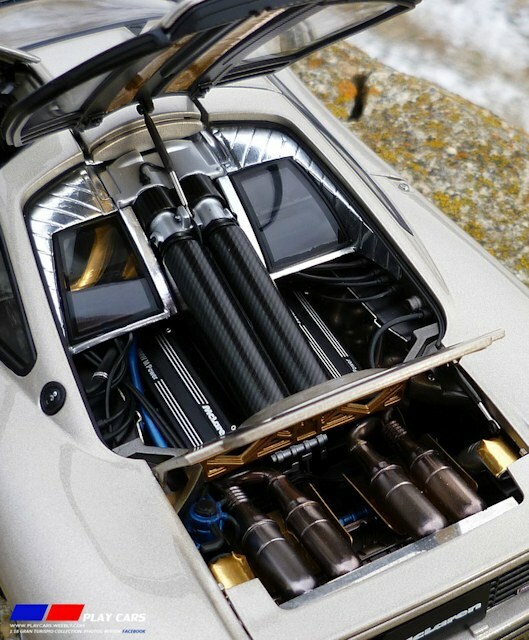 Under it are visible exhaust pipes finished with a perfect metallic look, some individually made parts separately painted and complemented by wires. The car’s little spoiler is functional, too. A very nice and accurate detail is the gold cover applied on the inferior part of each lid, including the spoiler, too. They’ve done it exactly like on the real car, it is fine and precisely applied. 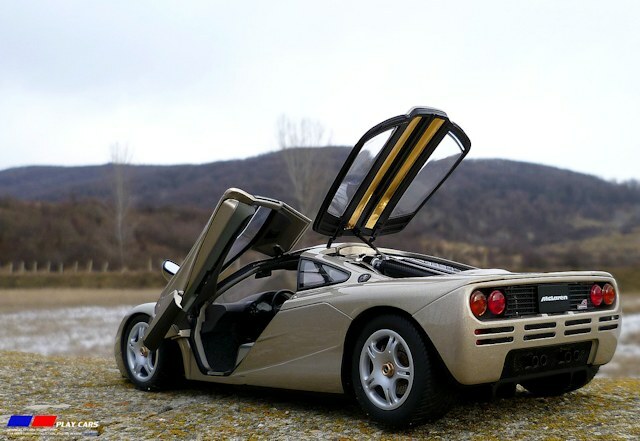 The same gold cover, real gold film on the real car, was applied under the exhaust pipes as well. 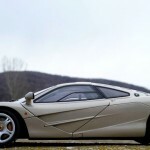 Everything here is a masterfully done, and AUTOart made a considerable effort to bring out the details of the real car and they did a perfect job. The photos above are the best proof of that fact. 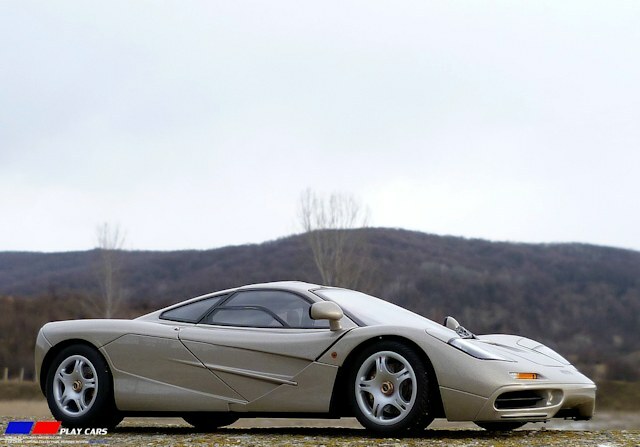 This model is fantastic looking and detailed, the manufacturer captured the essence of the real McLaren F1 very well. They’ve created a little masterpiece, replicating the engine with its little fine details. It’s a beautiful crafted, accurate and quality model, and I wish to see such level and attention on many other models in the future. This is a must have.